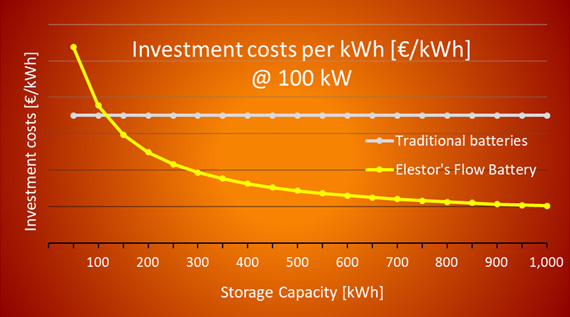 To determine whether Elestor’s mission (“Reducing electricity storage costs to the absolute minimum”) is indeed accomplished, it is important to have a common understanding of the definition of ‘Cost of Storage’. This obviously goes beyond simply considering the investment costs (Capex) for a particular storage system. 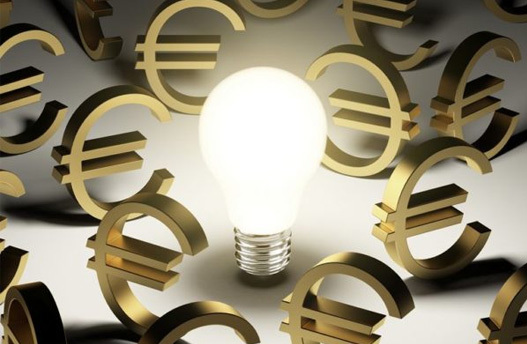 ‘Cost of Storage’ is a very important figure because, in essence, it determines the economic value of a storage technology, thus of its market adoption, and finally of its impact on the energy transition. Over the years, ‘Cost of Storage’ has been quantified in several ways. Today, and particularly with flow batteries stepping forward, the terminology as well as the mathematical approach needs some adjustment. To objectively compare different storage technologies from an economical point of view, the so-called ‘Levelised Costs of Storage’ or LCoS has been introduced. The LCoS says potentially what the bottom line costs are for storing 1 kWh, thereby taking several system characteristics into account. In literature, the LCoS is presented in various forms, whereby the differences are mainly found in the number of parameters that are considered in the calculation. A scientific approach, taking many detailed parameters into account, is given by Lazard. 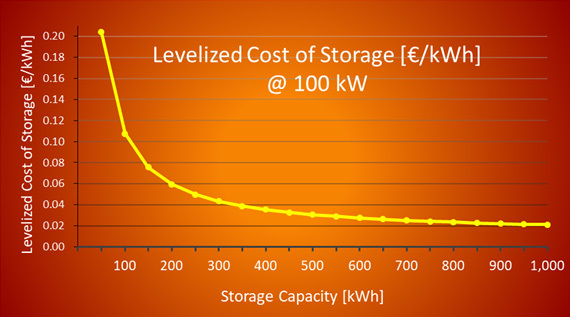 In its most simplified and traditional form, the LCoS calculation only considers the ‘Investment costs per kWh’ [€/kWh], the ‘Lifetime of the storage system [cycles]’, and its typical ‘Roundtrip (dis)charge efficiency [%]’, as above. This approach has been a proper and workable way to objectively compare the storage costs per kWh of different technologies. And this has indeed been true for a long time – until flow battery technology started gaining popularity. While the ‘Investment costs per kWh’ is a fixed figure for traditional technologies, this is different for flow batteries. After all, flow batteries can be designed with virtually every combination of power [kW] and capacity [kWh]. The investment costs for such systems are not only a function of their capacity [kWh], but also of their power [kW]. Therefore, above LCoS calculation can in this form not be applied for flow batteries. If, for instance, doubling the storage capacity of a traditional battery is desired, then automatically also the power is doubled. In fact a second complete storage unit is added in this case, obviously also resulting in double investment costs (Capex). Since power [kW] and capacity [kWh] of traditional batteries have a fixed ratio, the investment costs can simply be expressed in a fixed number of ‘€ per kWh’. The Capex of such systems is then calculated by multiplying this constant by the desired storage capacity. This is, however, different for flow batteries. With flow batteries, doubling the storage capacity [kWh] only means : Doubling the volumes of active materials. The system’s power remains unchanged and this then obviously does not result in double investment costs. The additional costs for doubling the capacity of Elestor’s solution are only marginal, because the active materials (H2 and Br2) were purposely selected for their low cost. Confused? Here is a different approach! This calculation fundamentally leads to a true cost figure per kWh, whereby the most dominant factors are considered. Furthermore, it allows an objective comparison of all kinds of storage technologies, traditional and contemporary. At a given power, in this case 100 kW, the storage costs of Elestor’s flow battery drop fast with an increasing capacity. In this example, a cost level of below € 0,05 per kWh is realized at a capacity of around 250 kWh and beyond, in other words, for a system that can deliver continuously 100 kW power for 2.5 hours or more. The graph also shows that Elestor’s technology becomes increasingly economical at large capacities versus power ratios. The reason for this is that at high capacities at a given power, the total system costs approach the costs for the active materials – and these costs are very low. Especially for Elestor’s battery, this Residual Value is a number with great relevance: During its lifetime, the electrochemical storage process does not degrade and therefore none of the chemicals is consumed. As a result, a large part of the storage system keeps its original value. Because of the fact that the HBr battery is well accessible for service, upgrades and refurbishment, cell stacks can easily be replaced at their end-of-life. This gives the Flow Battery a full second life. 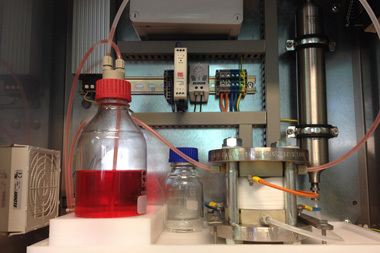 The Residual Value of a hydrogen bromine flow battery system is therefore significant. Including the Residual Value in the cost calculation for Elestor’s flow batteries, considerable lower figures for LCoS are achieved than displayed in above graph. Last but not least, the figure for ‘Capacity [kWh]’ must be interpreted as the practically usable capacity, which is not necessarily the same as the purchased capacity. Traditional storage technologies do generally not allow full charge/discharge between 0% and 100% without compromising the system’s lifetime. In other words, if a traditional battery would be used between 0% and 100%, then its lifetime will be dramatically shortened. 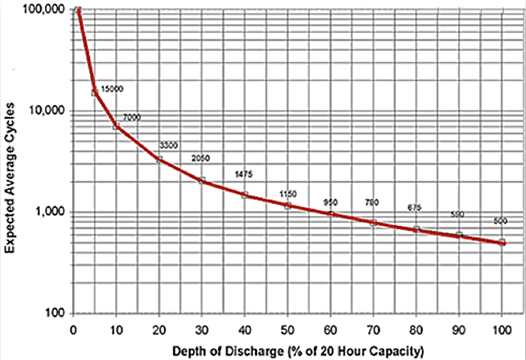 In battery specifications, this phenomenon is referred to as ‘Depth of Discharge’ or DoD [%], describing the maximum allowed charge and discharge level. Following graph shows the relation between DoD and Lifetime of traditional storage systems. For traditional batteries, the practical DoD is roughly in the range of 50%, as these batteries are commonly operated between around 25% and 75% state-of-charge. This is done with the purpose to prevent a significant lifetime reduction, which would occur with a larger DoD. The in practice usable storage capacity is equal to DoD * purchased capacity. As such, a DoD of 50% immediately results in doubling the LCoS, because only 50% of the purchased capacity is practically used.